Serve up an “Ace” in the Game, Set, Match Medical ID bracelet! A Lauren’s Hope exclusive style, this sporty med ID is made of hypoallergenic white silicone in a link-style design with rose gold tone findings. Flexible and water-friendly, Game, Set, Match is a casual med ID that’s on-trend for athletes and spectators alike! Game, Set, Match is an interchangeable medical ID bracelet, so you can wear it with any custom-engraved Lauren’s Hope medical ID tag, keeping what’s truly most important to you right at hand. 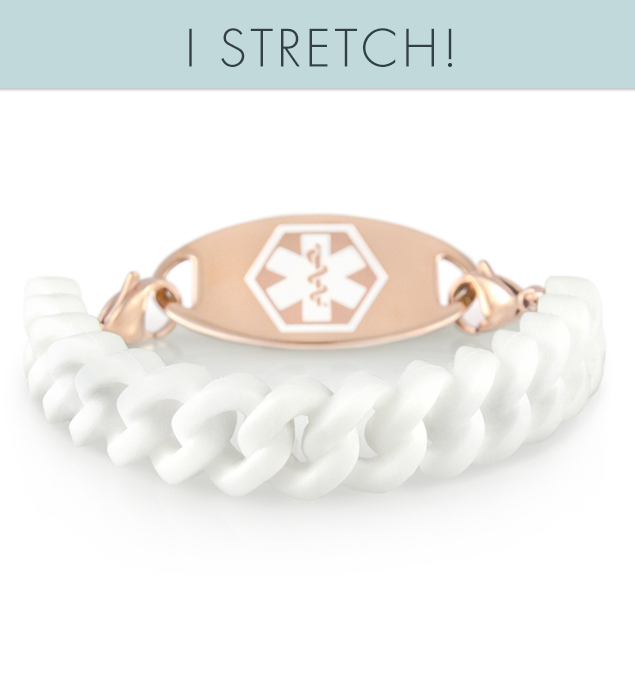 This on-trend med ID is a great choice whether you wear your medical alert bracelet for epilepsy, hypothyroidism, weight loss surgery, lymphedema or post-mastectomy care, heart conditions, or any other medical condition or treatment consideration. Custom engraving allows you to choose the look you want so you can stay safe in style.